Tom Jackson scored an 89th minute winner as Liversedge defeated Harrogate Railway last Saturday. Liversedge broke their home duck in the Northern Counties East League Premier Division as they earned a 2-1 victory over Harrogate Railway Athletic last Saturday. Liversedge’s previous four wins had all come on the road, including a midweek 4-2 success away to Albion Sports when Brandon Kane bagged a second half hat-trick and Alfie Raw also struck as they fought back from 2-0 down. 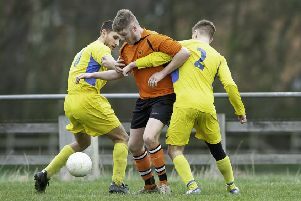 That result lifted Jonathan Rimmington’s men out of the bottom three and proved the ideal tonic for the visit of fellow strugglers Harriogate, when they followed up with a second straight win. Harrogate had plenty of possession during the match but struggled in the final third of the pitch as the Livesedge goalkeeper was only forced to make one save during the 90 minutes. The game sprung to life in the second half after a goalless first 45 minutes and Aaron fell put Liversedge ahead from a 53rd minute penalty. Harrogate looked to be on the verge of denying Sedge a crucial win when Fatlum Ibrahimi fired through a crowded penalty area to grab an equaliser nine minutes from full-time. Tom Jackson produced a well timed tackle when Harrogate threatened again and the Liversedge captain then popped up to score a cracking 89th minute goal which earned his side all three points. Victory saw Liversedge climb to 15th place in the table with 17 points from 18 matches, five ahead of third-bottom Hall Road Rangers, and they have now opened up a 10-point gap on Harrogate Railway and Goole AFC, who are joint bottom with seven points. Saturday’s game was the start of a sequence of five straight home matches for the Clayborners. Their next four games are also on home midden and Sedge to not travel again until December 29 when they visit Worksop Town. The December programme includes some tasty fixtures as they host local rivals Eccleshill United on Saturday then facebottom side Goole (December 8). Sedge welcome Thackley to Clayborn on December 15 and then face Garforth Town on December 22.